If you are in need of a boat or crew for this event, we have created a dedicated post just for you. 0900 – 1100 Registration, $60 Includes a T-shirt and Dinner, Students $20 (No T shirt nor dinner), First warning at 12:30 Dinner tickets $12. Pasta, Door Prizes and raffles. Man Over Board Discussion, 6:00, Free Participation. A panel of 5 professionals, with moderator. 3 scenarios of Man Over Board with discussions from a marine electronics representative, a marine safety equipment representative, ASA certified Sailing Instructor, Life Guard and USCG SAR personnel. Question and answer period to follow. Registration at 1200-1300 $20. Open to any dinghy with a Portsmouth Rating. If no rating is available one will be assigned. 1400 start in Melbourne Harbor. Race to Melbourne Beach Pier, with a few mark roundings in between. Enjoy some snacks and beverages at the pier. Second race starts at the pier (approx. 1530) and finishes off the East dock of MYC. Awards will be presented at MYC. 1700 Free participation. PHRF Practice starts in the vicinity of the Rum Race Can. If you can’t make it till later, come anyway sequences will continue till just after dusk. MYC bar open afterward. Free participation, 1600 boat set up, 1700 first heat. 1830 Pot Luck Dinner, bring your dish. Awards to be presented. 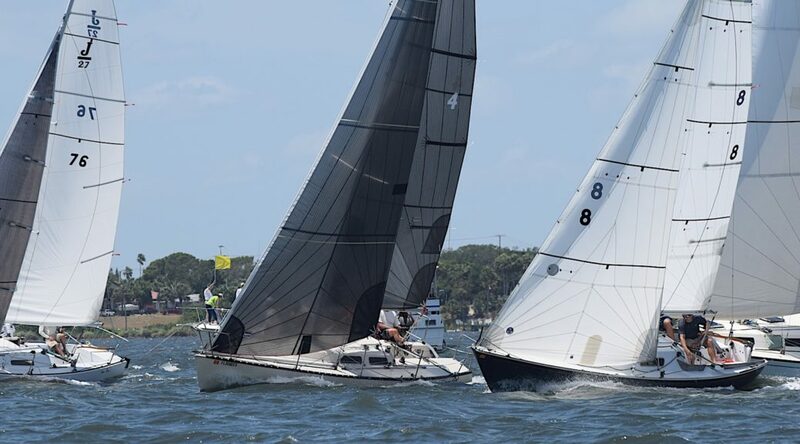 2 PHRF Triangle Races, Registration 1100 – 1230, $100 (all weekend races, includes t-shirt and dinner ticket – additional dinner tickets $15). Skipper’s Meeting 1230, First Warning 1400, Race Two start after, approx. 1600. You may participate in one or both races, scored PHRF Time on Time, awards for each race (do not apply to Sat/Sun Regatta scoring). Dinner of burgers and dogs included for racers, Additional dinners (if available, for $8) Awards presented at dinner. Registration for Saturday and Sunday distance and one design races 1800-1900 $100, (Includes t-shirt and dinner, additional dinner tickets $15). Skippers meeting at 1930. PHRF Triangle Race Start at 1100. Awards to be presented at Dinner. Conclusion of racing, 1500 Dark & Stormy Party, Awards, prize giving – Sailor of the Week, Boat of the Week.